Sarasvati supervises Anatomy and Asana teacher training for the Australian College of Classical Yoga. 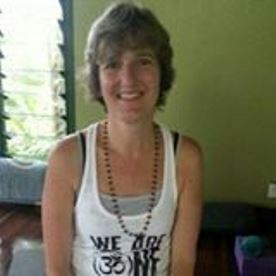 Her own Yoga school is Waverley Yoga, where you can find other writings on her Blog. I have been studying Yoga with Mataji since 2001 and continue to peel away the layers of resistance to experiencing the Love and Freedom of Self. 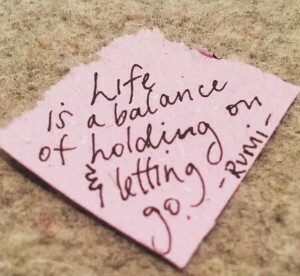 Anyone seriously treading a Yogic path will hear about having to ‘let go’. Let go of our ideas of how things should be, because Reality is what it is, regardless of what we think. Certainly my teacher Mataji teaches this, and it has been really helpful to me. Let go of our thoughts in meditation. Do what we have to do but let go of the outcome. Letting go of control in particular. A big one hey? Being OK with how things are. I know in my own life, I have been practicing letting go of trying to control things – surrender – for many years. And have found that if I don’t try to control outcomes too much, things flow much better. But also in Yoga we hear about having Discipline. Like anything in life, if we want to get better at it, it requires some effort, some discipline, some practice. Discipline to get on the mat. Discipline to keep up a regular practice. is a familiar quote in the Yoga world. And rightly so. Discipline to stay focused in Meditation and not follow every thought that is there, just to watch quietly. But not so much discipline that you are rigid, as that will prevent you from getting to a nice meditative state! Discipline to see others as Self too and therefore to treat everyone equally. The Yamas and Niyamas, the first 2 of Patanjalis famous ‘8 limbs of Yoga’, are really discipline practices. They outline disciplines of external behaviours (non harming, truthfulness, non stealing, non grasping and treating all equally) as well as mental behaviours (cleanliness, contentment, having discipline, self-study, surrender to what is). Yes, even the Niyama ‘Isvara Pranidhaha’, surrendering to God, to Consciousness, or simply to ‘what is’, is a discipline. The 8 Limbs are guidelines that Patanjali suggests will help us experience the Union that Yoga offers, that would be the natural state we would be in if we got off being so involved in our thinking state. Is there a conundrum here? If we practice letting go, complete surrender to ‘what is’, how can this fit with being disciplined in our practice? If we are really surrendered, then we wouldn’t be too fussed about anything. Wouldn’t think about how our thoughts and actions might affect others. Maybe wouldn’t care what food and drink we put in our body. Wouldn’t worry about social norms. On the other hand, if we overdo the discipline we could become a bit paranoid about doing everything right and perhaps lose the enjoyment of simple pleasures. Missing the forest for the trees. Perhaps we would be unable to break from the shackles of having to be ‘in control’. For me, I am realizing that living a Yogic life requires both discipline and letting go. Discipline to stay relatively fit and healthy, rather than giving in to sloth. Discipline in treating others with care, respect and love. Discipline in the way I treat my body. Discipline in being OK with myself and others. Discipline in maintaining a sense of loving connection with all, even when it temporarily goes astray (!). Ultimately we DO have to surrender to what is. That final surrender is our last breath. But in the meantime we DO have a say in how we go about living our life. Can we find that balance in being surrendered and yet disciplined in honouring ourselves and others? Is that what navigating a Yogic path – living Life – is about? What do you think? I’d love to see your comments! I'm grateful to be on this amazing journey of Yoga and to get to share all things Yoga too. I have been studying Yoga with Mataji since 2001 and continue to peel away the layers of resistance to experiencing the Love and Freedom of Self. Namaste and Love. This entry was posted in Behaviours and Relationships - the Yogic Way, Philosphy of Yoga, Reality-Based Spirituality and tagged article, control, Sarasvati. Bookmark the permalink.